Much of statistical sports analysis is rooted in economics. Many of the statistical tools used in sports research are the same tools used in economic research, such as multivariate regression, utility theory, and game theory. Professional sports offer researchers a somewhat controlled labratory to examine more general economic principals. But there is an unarticulated question at the heart of sports research: What is the point? What’s the bottom line? What are the athletes we study trying to accomplish? Making sense of any activity requires an understanding of the ultimate goal. To many economists, who have a financial orientation, the bottom line is quite literally the bottom line. To fans like me, the bottom line is winning, not revenue or profit. But economists often see professional sports in terms of financial gains and losses. I think researchers like me, who focus on wins, and professional economists, who focus on profit, are both missing a very large part of the picture. If there is one thing that economics teaches us, it’s that incentives matter. The real question becomes, what are the incentives? For most of the history of economics, money was treated as the only important motivator. After all, money obviously does motivate nearly all people, plus it’s easy to measure. But there is far more to motivation and incentives than money, and economists would be the first to admit that. But just like how we admit measuring individual player performance is flawed and incomplete, it's done anyway simply because it can be measured. There are two general categories of motivation. Extrinsic motivation consists of incentives that come from outside the individual. Money is the best example of extrinsic motivation, but there are other forms, which I’ll discuss in a moment. Intrinsic motivation consists of incentives that come from within the individual. It might be best described as that warm satisfaction someone feels when he accomplishes a goal. 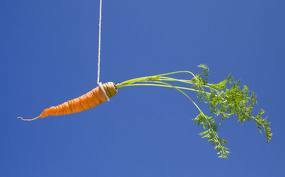 Some recent research suggests that once someone meets a minimum level of extrinsic reward, intrinsic rewards take over as the dominant form of motivation. People are intrinsically motivated by what author Dan Pink calls autonomy, mastery, and purpose. (Here is a video of Pink's TED presentation.) Guys like Albert Haynesworth are looking for autonomy. They want to do what they want, when they want to do it. Bill Parcels was looking for autonomy when he wanted to "shop for the groceries." Peyton Manning, Ray Lewis, and Bill Belichick are looking for mastery. They are financially set for life, but are still driven to be the best at what they do. Purpose? You won't find much in sports, but that doesn't stop much of the sports media from pretending there is. It seems that one of the main narratives in sports writing is to gin up a false sense of purpose for what athletes do on and off the field. Half of the Olympics broadcast are personal interest segments designed to create the illusion of purpose on the part of the athletes. Football is no different. However happy you may be for Drew Brees and the 2009 Saints, their championship will have no meaningful, lasting effect on wounded New Orleans. You want purpose? Join these guys. Money is only one form of extrinsic motivation. A more powerful form of extrinsic motivation may be esteem, especially among peers. To players, big contracts bring more than just what the money can buy. The money means respect and esteem from other players, which is what I suspect truly motivates them. Money is important partially because it’s one of the measuring sticks by which they compare each other. They constantly speak in the currency of "respect" in their interviews and press conferences. It's why they want you to put them on your fantasy team, not necessarily because they want your respect, but because it raises their status in the eyes of their peers. Consider Tennessee quarterback Vince Young’s recent hissy fit. He wasn't upset Tennessee fans booed him. What blew his gasket was that the booing lowers him in the eyes of his peers. And he may not really care what head coach Jeff Fisher thinks, except that it demotes his status in the locker room. Helmet-to-helmet hits have been an issue the NFL has focused on this season. But the league is not going to make much headway until those kinds of hits are thought of as cheap shots by the players. Fines aren’t going to do the trick as long as the players are lauded by teammates for knocking an opponent out of the game. Fines may even be counterproductive to some extent, if they are seen as a badge of honor. Peer influence may be the only force powerful enough to curtail the problem. Peer esteem matters to owners and management too. The money isn't the main issue as long as their franchises are not hemorrhaging cash. They want the esteem of being the owner or manager of a championship team. Look at guys like Jerry Jones or Dan Snyder. They would never be satisfied with simply owning a winning team. They want the credit for building a champion, not just from fans, but from the clique of other owners and from the other elites with whom they rub elbows. Esteem may seem like a vain and superficial thing to those of us in a modern society, but it almost certainly didn’t seem that way to our ancient ancestors. Human beings are compelled to compete and to win. It’s in our nature. We are all the descendants of winners, those early humans who competed with each other, often violently, for survival and for reproductive resources. In the early tribes of humans, the victors of competition were rewarded with high status, which allowed them a greater share of their tribe’s resources. We're all the result of that process. Money, whether in the form of player salary or owner profit, only explains a part of the picture. Much of what drives the people in professional sports has little to do with money. If the behavior of a player or owner appears baffling on the surface, think of how their actions affect their standing within their peer group. It might explain a lot. Great post and so true. Interesting thoughts on the way to tackle Helmet-Helmet hits also. i tought and hoped for this article would be about motivation (moral) in games when nothing is to gain. Like in a blow out when both sides "quit" the game and only act until the 60 minutes are over. That´s no joke, because players admitted there is a point in a game when injury prevention become a bigger part than winning (from being behind). The 2 players i know who openly spoke about this issue were Tim Green (in his book "The dark side of football") and Paul Breitner (a famous german soccer player). So it´s a myth when people say, the players never give up, because they want to keep their job. Now it would be an interesting study to find out how much "noise" (next to the random events) is in stats when players have nothing to play for (not only in blow outs, but may also in late season games when playoffs are out of reach). I agree with the helmet-to-helmets comments. These hits will not be lessened until the players think it's wrong. Peer pressure incentivizes these hits much more than a fine can de-incentivise them. The only way to eliminate the hits is to make it hurt your teammates. Egregious hits should be penalized by ejection and suspension. Brandon Merriweather should have been suspended for his hit earlier this year. That way the penalty hurts the whole team and peer pressure is redirected dowager avoiding these hits because it will hurt your team. James Harrison already said that he wouldn't change his style of play no matter the fine. However, his team may force him to change his style if it causes him to be suspended. I totally agree on the helmet to helmet hits. I actually prefer solid, Champ Bailey type tackling. I bet analysis would show that clean tackling would result in better defensive outcomes-for the team. But in terms of esteem in the eyes of the individual defenders peers, it's better to blow guys up-even if you risk a missed tackle to do so. The perceived value of contracts relative to your peers, to me, is quite clearly the driving factor during contract negotiations. Look at Vincent Jackson, Darrelle Revis and all the other holdouts. Revis wanted more money than Nnamdi Asomugha's contract - NOT X million or his true value to the team, but simply more than someone else to "prove" he was better. I was going to post the whiteboard video. It's really cool, but I don't like the ideological message at the end. It's off-base and kind of ruins the rest of the message. You're going to be a speaker at the Sloan Sports Conference? Congrats! No. I'm pretty sure that's the other Brian Burke--the GM of the Maple Leafs. Great post. An interesting way of thinking about things. Please forgive the tangent here. Along the lines of economics and sports, you might want expand the comparison and start thinking about marginal returns versus average returns. Where I am specifically thinking about this is with regards to play calling. This thought process might overlap with game theory and I have no idea how you would create a model. However, in creating a mental model, it might yield some ideas and insights. i'd just like to point out that there currently exists a field called "sport psychology" that's been around for 100 years, with people called, "sport psychologists," who have spent the better part of the past 30 years really honing in on what motivates athletes. i direct interested readers to vallerand & rousseau's chapter in singer et al's handbook of sport psychology (2001) wherein they review the sport motivation literature up to that point. their hierarchical model is especially illuminating. sorry for the snark, but having an entirely useless masters degree in sport psychology makes me kind of bitter whenever i see psychological concepts in business and economics being applied to the sports world as if filling a vacuum. Peer esteem matters to owners and management too. The money isn't the main issue as long as their franchises are not hemorrhaging cash. They want the esteem of being the owner or manager of a championship team. Peer esteem and esteem of the public matters to everyone, especially pro sports team owners, *but* I think in other sports cold hard profit making matters relatively a good deal more to team-running decisions than in the NFL. In the NFL, with revenue sharing, the salary cap, etc., the owners are much more in the same financial boat than in other pro leagues. In MLB teams like Pitt and KC have no realistic chance of winnging championships, and there's lots of evidence that teams like them sacrifice wins to increase profits. In the NBA high scorers are clearly overpaid compared to other players who do more to actually win games, because fans like scoring and it sells tickets. Hey, pro sports is a business, one has to expect teams to run to the incentive of making money. The NFL is the most popular pro league in no small part because because the owners put themselves in the same financial boat so they are incentivized to compete for wins. Each team has a chance, and they all go for it. The decision made back in the 1960s to share TV revenue was *huge*. Imagine if the Yankees had to share their revenue with KC and both had the same salary cap. MLB would be like it came from a different world. That's the difference very base, practical, concrete incentives make. Several years ago, I tried to show that baseball and football had very different winning percent distributions and teams were more likely to change their winning percentage year to year. The two leagues from 1994 on were pretty much the same. I concluded parity in the NFL is a myth.